Oklahoma Product Liability Law provides extensive coverage of all aspects of products liability actions in Oklahoma. An essential resource for practitioners, it covers issues ranging from the foundational, including multiple theories of liability and negligence actions, to the exceedingly complex, including the significance of warranties and available manufacturer defenses. 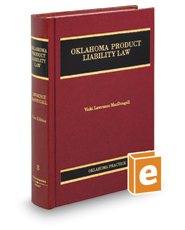 Analysis of proper parties and recoverable damages, as well as practical approaches to addressing problems of proof and conflicts of laws, make this an ideal title for any attorney interested in working in the burgeoning field of products liability in Oklahoma.